In 2010, the adventuress, Linda Beilharz (50), has become the first Australian woman to have reached the South and North Poles on foot. Her objective is to conquer the four largest icecaps of our planet Earth, the North and South Poles, Greenland, and Patagonia. Spring 2010 : In company of her husband rob Rigato, Linda Beilharz (50) and the young Canadian guide Sarah McNair Landry (23) reached the North Pole on 26 April after a course made more than difficult because of the particularly trying conditions for making headway, and in particular the violent headwinds and a constant negative drift that bedevilled them throughout. They had remained on the ice for 55 days and were resupplied twice. Linda lost 10 kilos in the course of the adventure. Linda has established a not for profit company called 'Journeys for Learning' which uses the stories of expeditions to draw out the themes of resilience, team work and environmental sustainability in schools and community settings. Journeys for Learning supports teachers with learning resources and lesson guides and links schools to the expeditions as they take place. Linda is the Executive Officer of Women's Health Loddon Mallee after being a Director of Community Capacity Building with St Luke's Anglicare for 10 years. Linda has provided support to communities, training to workers, advice to governments and undertaken consultancy services based on her extensive experience in building stronger communities. Linda has published a book based on her work entitled "Building Communities; the Shared Action experience". Linda has a number of academic qualifications including a Graduate Diploma in Community Development and a Masters in Health Sciences. 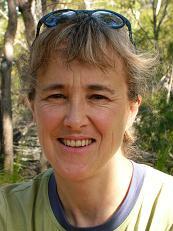 She is a private pilot and a committee member of the Bendigo Sustainability Group and alpine SAR (search and rescue). In 2004 Linda Beilharz became the first Australian woman to ski from the edge of Antarctica to the South Pole. Linda then set herself a goal -to traverse the world's four icecaps- Greenland, South and North Poles and Patagonia. So far she has achieved the Greenland Icecap crossing (2007) and has attempted an expedition on the South Patagonia Icecap (2009).